I would not be doing my job, on today of all days, if I did not tell you that you really should read the Power Man and Iron Fist Sweet Christmas Annual right this instant. This year’s latest seasonal comic from Marvel—by David F. Walker, Scott Hepburn, Matt Milla, and Clayton Cowles—is a Luke Cage/Danny Rand team-up special, in which, mid-Christmas-shopping trip, Power Man, Iron Fist, and Jessica Drew’s Spider-Woman are accosted by an army of demons disguised as toys that are helping Krampus attempt to consume the souls of humanity. God bless Luke Cage’s ardent goal to not curse in front of children. ... and gets an answer. In the form of modern-day badass Santa Claus. Who proceeds to beat the living daylights out of Krampus, revealing he’s been lying in wait for a hundred years to allow Krampus to get complacent, so he can give him the beatdown of his demonic life. 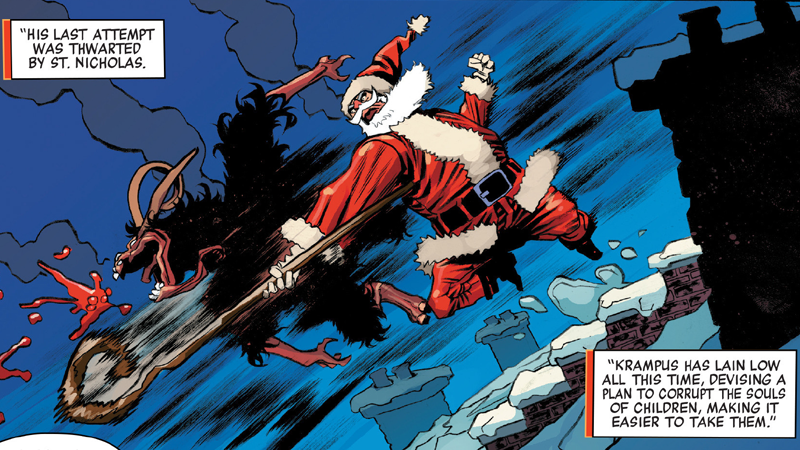 Santa saves the day, and reminds Danny, Luke, and Jessica that the true meaning of the holidays is love... which he tells them almost directly after rendering Krampus unconscious and bloodied, as he drags the limp demon back to his sleigh. Have a good Christmas, everyone. I hope you were visited by a version of Santa almost as rad as this one.